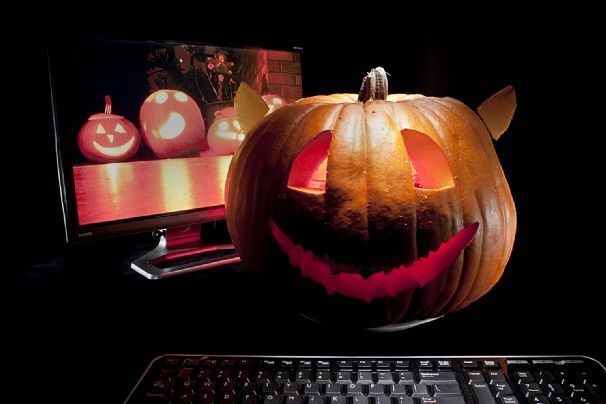 Carving Pumpkin PC Case, Happy Halloween ! Home / Featured / Carving Pumpkin PC Case, Happy Halloween ! Happy Halloween ! 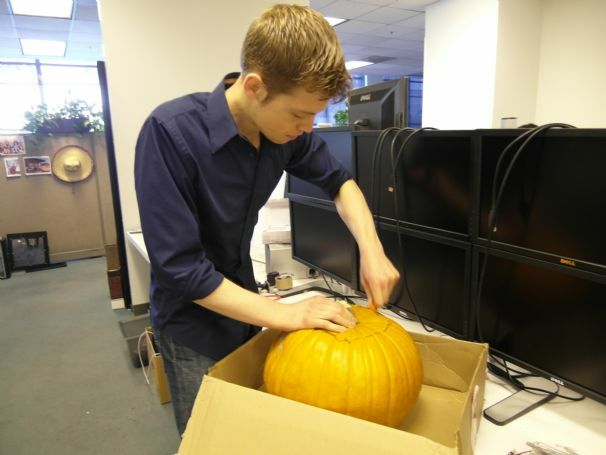 To celebrate, we spent a perfectly good workday carving up a pumpkin PC case, and we made sure to document the process for your viewing pleasure. If you have a few hours this holiday weekend and you’d like to carve your own, click through to see how we did it. Pick out the biggest pumpkin you can find, at least a foot in diameter. Before embarking on this kind of quest, it’s important to ensure that you have the tools to do the job right–the last thing you want is a leaky pumpkin dripping goop all over your CPU. We used a simple pumpkin-carving kit that shouldn’t cost you more than $10. Assemble your components and power them up to make sure everything functions before you try cramming the works into an actual pumpkin. Now that you’ve picked out your pumpkin, carve a lid around the stem and get your hands dirty disemboweling your new case. 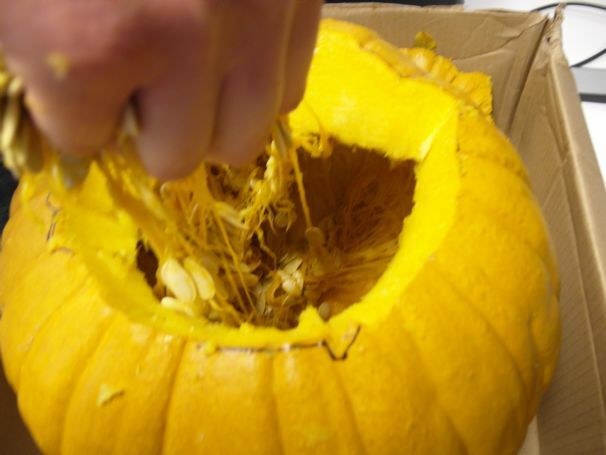 Make sure to scrape down the sides thoroughly and clean out all the goop to ensure that you don’t get any pumpkin seeds and/or entrails on your components. Instead of trying to finagle our components through the top, we found it easier to carve a nice, wide hole in the rear to accommodate the single largest component of the pumpkin PC (in our case, the power supply). Slip in a waterproof base (we repurposed some cardboard and wrapped it in plastic), and make sure to leave plenty of space for running your power, display, and Internet cables out. If you’re feeling extra crafty, carve the access port in one large, replaceable chunk to keep the pumpkin looking smooth when not in use. Once you have everything squared away, it’s time to start building your PC! 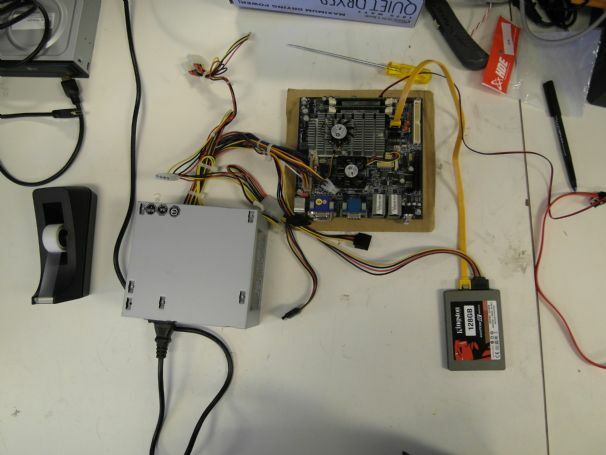 We divided the project into manageable chunks (in our case, the power supply, motherboard/CPU, and a 200mm case fan) and slid them in one at a time, inserting one hand through the top to steady and assemble everything. 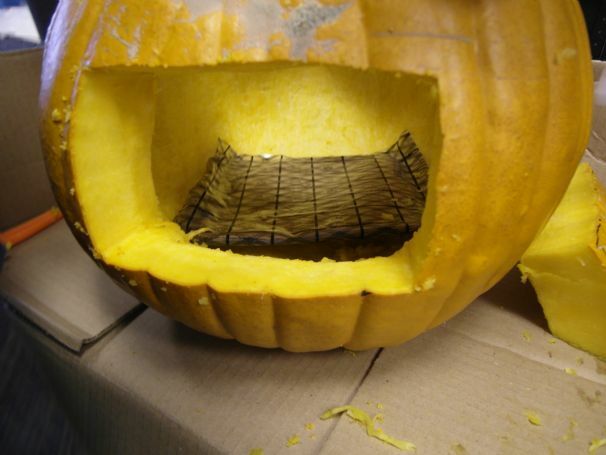 We mounted our case fan with a few pieces of high-strength wire inserted into the sides of the pumpkin, but you could achieve the same effect with a little ingenuity and a few bent paper clips. Keep an eye out for detached cables, and make sure that nothing is dangling in the case fan before you power the system up. 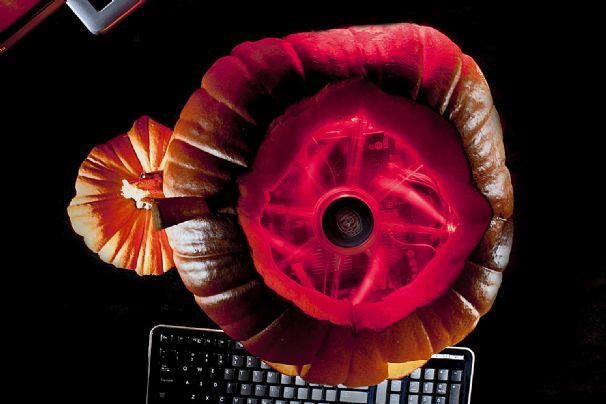 Plug in the power supply, hook up a monitor, and boot up your brand-new pumpkin PC. If all goes well, you’ll have the spookiest computer on the block–and in a few days, one of the moldiest! 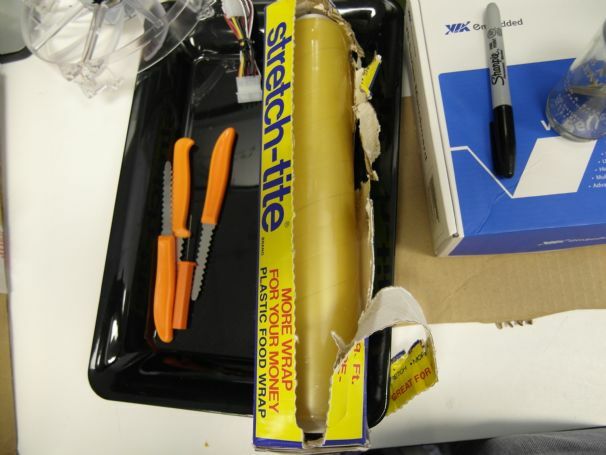 (If you want to preserve your work, you might try covering it with shellac.) Happy Halloween!